Todd Pugh revamped his company’s culture after a less-than-stellar employee survey. Attendees of the JP Horizons Face to Face event came to learn about the Louisville, Ohio-based company’s focus on culture and employee relations. Banners hang from the ceiling of Enviroscapes’ garage like retired jerseys in a sports arena. Each features an employee’s photo, name, current and past job titles, and the year he or she assumed each position. The banners remind employees, new and old, of where they can go within the company. For visitors of the Louisville, Ohio-based landscape company, the banners represent the company’s dedication to culture and people. You could argue this dedication is much of the reason the company—which performs 20 percent construction, 65 percent maintenance and 15 percent snow removal for a commercial clientele—is pulling in $15 million in yearly revenue and growing about 15 percent per year. Owner Todd Pugh does. It was this culture—not the multimillion-dollar facility with a rolling farm landscape—attendees of the JP Horizons Face to Face event came to see on Sept. 20. The all-day event, which drew more than 80 people, gave insight on Enviroscapes’ inner workings and on how the company’s leadership revamped its culture. 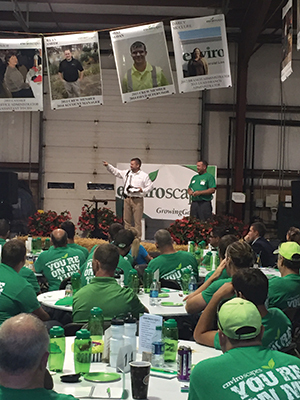 For those who couldn’t make the trip to Ohio farm country, here are some tips you can take from Enviroscapes to revitalize your company’s culture. It took a slap in the face before Pugh, who started the company formerly known as Todd’s Landscaping at age 17, and his team focused on developing an employee-centric culture. Five years ago, Enviroscapes employees filled out an anonymous questionnaire. Pugh wanted employees to be brutally honest, and they were: 80 percent said they were actively looking for new employment or wouldn’t recommend working at Enviroscapes to a friend. 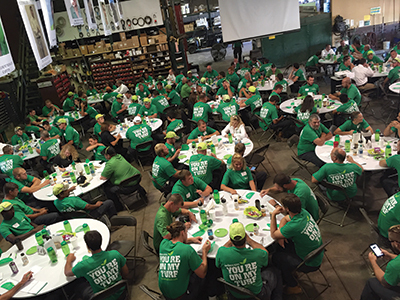 Enviroscapes’ focus became achieving “destination workplace” status for its employees. That meant not just creating a good place to work or a great stepping-stone to a better gig but being the better gig—a place for talented professionals to build a career. Every employee is motivated differently, Pugh says. For some, gestures like cookouts, Gatorade on hot days and on-site dinners when jobs run overtime were enough motivation. Paid time off and robust benefit packages raised morale, too. Taking it a step further, the company hired a financial adviser to keep on retainer. Any Enviroscapes employee can meet with the adviser for free. The company made this offering a prerequisite when it sought out 401(k) plan administrators. The adviser even attends the company’s annual Growing Day employee event to discuss the value of the plan and delayed gratification. Benefits help, but Enviroscapes really became a “destination workplace” by offering opportunities for personal and intra-company growth. Growing Day, an annual event with speakers and company updates, is one part of the new culture. Growing Day—a $50,000 event with guest speakers, internal growth stories, a financial review and other personal development initiatives is the cornerstone of the company’s culture transformation. Some of the company’s best employees rose through the Enviroscapes ranks, Pugh says. Much of the day is dedicated to these homegrown employees’ stories, which help newer employees understand the ladder they can climb and serves as a reminder for stagnant ones. A one-day event can be easily forgotten, though, so the company strives to continue personal and professional growth opportunities throughout the year. This year, it implemented the Supervisor Boot Camp, a customized corporate university produced by faculty from nearby Kent State University. About 20 managers and 20 lower-level employees deemed “rising stars” by their peers participate in DiSC assessments, lessons on time management and conflict resolution and more. The professional development course costs the company $1,000 a session, and the company has hosted about one session a month for the past six months. Enviroscapes also has benefitted from an incentive program called Green Bucks Incentive (GBI). It gives employees the chance to earn an extra $300 a month—$200 if your branch hits its mark and an extra $100 if all branches hit their goals. The program centers on safety, quality, image, productivity and attendance. Branches earn strikes if a truck isn’t clean, if a member doesn’t give two-weeks notice before calling off, if a member isn’t in full uniform and other offenses. They can offset strikes by receiving compliments on Facebook or via email. The team aspect of the GBI program has had a unifying effect on the branches. In 2007, Pugh did the unthinkable: He let go 82 percent of his customers, totaling 450 residential mowing accounts. Before you write him off as a madman, understand the move only shed 18 percent of the company’s revenue. Since the move, the company has experienced continual growth. It’s done so by focusing on the “Enviroscapes client” and knowing what that looks like. Its clientele is only about 5 percent residential, and every one is connected to a commercial property the company maintains. For maintenance, that client has three to five acres of mowable grass or parking lot the company can maintain. Design/build/installation projects must be more than $100,000 or the client must be a friend/acquaintance of Pugh, an existing client or referral. Ideally, the company will be hired to maintain the property after the project. If the job isn’t a good fit, Pugh suggests a better-suited company. In fact, Enviroscapes is making an effort to dial back installation projects even more. 2 Comments on "A dispatch from Enviroscapes"
Great article Dillon! Enviroscapes sets a tremendous example for all of us! They have some great ideas. I would love a copy of the employee survey, any chance of getting a copy?